You’ll feel right at home in this charming, spacious and tastefully decorated three-bedroom, two-bathroom condo. The cathedral ceiling and open concept make the living area feel very spacious. 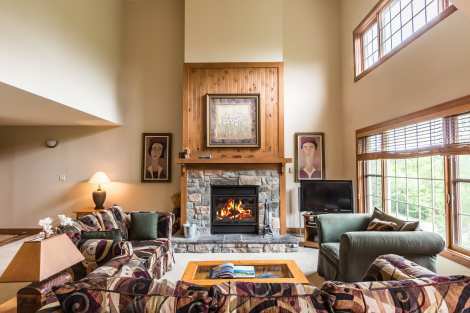 The comfortable living-room is furnished with cushy sofas where family or friends can gather in front of the lovely wood-burning fireplace. The kitchen is carefully equipped for meal preparation and opens onto the dining room and a large balcony. The master bedroom has a king-size bed and private bathroom with whirlpool bath. The second bedroom is furnished with a queen-size bed, and the third bedroom, with two comfortable single beds. The unit includes wireless access to high-speed internet, a cable TV, a DVD player and a compact sound system. The landscaping outside the unit is simply beautiful.